After last weekend, it seems like I would have had my fill in picking berries. But I was at it again this weekend! My pioneer women and I went to Iller's Berry Farm to pick blueberries. We met up at 8:00 in the morning to pick because the forecast called for highs in the 90s. It was actually really nice weather early on with a good breeze. About an hour into picking it did start to get pretty warm, but we were able to finish up in about an hour and a half. Everyone at Iller's was so friendly! We went up the hill to check in, then they sent us back down to the blueberry bushes were Steve was waiting to get us started. We were armed with buckets and given tips on how to pick the best berries. Steve said, "What you want to do is eat a lot of berries. Find out what the sweetest ones look like and pick those." I thought it was so cool that he said we could just eat right off the bush so we knew what was best to pick! The bushes were pretty full, but he said that later on this week (maybe Weds/Thurs) they will really be ripening like crazy, so heads up if you're in the area and want to pick blueberries! When we checked out, they had a couple of recipe cut-outs that we could take. I saw one for blueberry bars and knew exactly what I was going to do with my blueberries once I got home (there was no author on their recipe, so not sure of the origin). Let me tell you, this was just about the best dessert I've ever put in my mouth. 1) Preheat oven to 375. Line a 13x9" baking pan with parchment paper or aluminum foil, set aside. 2) In a medium bowl, combine flour, oats, 1/2 cup sugar, brown sugar, baking powder, cinnamon, and salt. Using a pastry blender (or just use your fingers) cut in butter until mixture is crumbly. Press half of flour mixture into bottom of prepared pan. 3) In a medium bowl, combine remaining 1/2 cup sugar and cornstarch. Stir in blueberries and lemon juice. Spoon blueberry mixture evenly over prepared crust. Crumble remaining flour mixture over blueberry mixture. Bake for 45 minutes, or until lightly browned. Let cool in pan completely (if you can wait that long!). Cut into squares to serve. *The recipe called for 1/4 teaspoon ground nutmeg, but I'm not a big fan of nutmeg so I just used cinnamon and increased it to 1 teaspoon. You could just use the nutmeg, or use nutmeg and cinnamon. 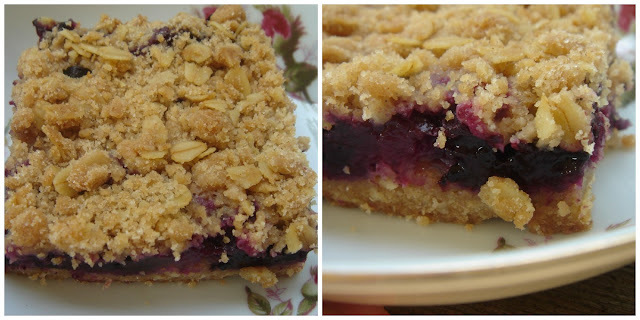 I picked about 6 pounds of blueberries, and even after making these bars I still have a lot of berries left. I'll most likely freeze the rest -- if there's anything left after snacking on them this week! Those bars look SOOOO tasty!! I do believe I will be snagging this recipe. 2 weekends in a row of berry picking....your kind of like a pro, now! Thumbs up to seeing berries growing on your homestead! Those look so good. Can you make some more when I get there? I'm definitely making these again, too! I put a lot of berries in my freezer so I can't wait to make them again later.